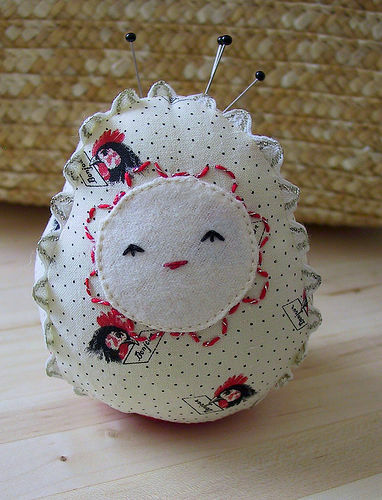 What an adorable pin cushion! I like the two color embroidery floss and the trim around the edges. will i be quizzed on this later? How fun! I love the metallic ric rac – it works really well with the colors and fabric! angry because I made him for angry chicken amy. new fabric, vintage glitter rick-rack. she is so lucky! that is adorable. gorgeous fabric. Dang! That is one cute wee, Hillary! I’m working on a quartet of “Wee-ha’s” (You’ll get it when you see them!) right now. I’ll email a photo when I’m done.